"I write this to you — what more can be said? What more can I add to that one fact? To punish me contemptuously for this act. Will not entirely abandon me." — Alexander Pushkin, Eugene Onegin, "Tatiana's Letter to Onegin"
A Love Confession in written form. When characters aren't brave enough to come out and say they like someone, the accepted way around a direct confrontation is a love letter, usually anonymously left in a shoe locker or prominent area, with a request to meet at a predetermined location. The intent is better known than the identity of the person; the letter is often pink, in cute handwriting, and smells like perfume. Bonus with lipstick marks. In Neon Genesis Evangelion: At the end of Asuka's first day of school, her shoe locker is entirely filled with love letters. She gets rather angry and steps on them. Nagisa in Futari wa Pretty Cure gets unwanted love letters from other girls. Megumi in Cheeky Angel gets love letters from both sexes, as well as her True Companions and Instant Fan Club. Hazumi in Yami to Boushi to Hon no Tabibito receives love letters from one particular girl whose identity she heartbreakingly fails to figure out. Tomari from Kashimashi: Girl Meets Girl gets love letters from other girls. This is very much to her dismay, even though she does fall in love with her old childhood buddy Hazumu after he changed into a girl. 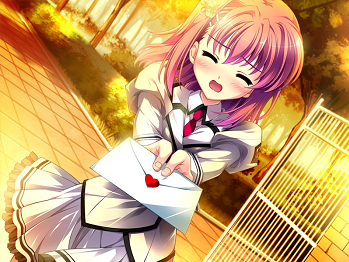 In D.N.Angel's first chapter, Daisuke gives Risa a love letter, but she turns him down. Sakura gets a love letter from a shinobi from the Rock Village. She politely turns him down, saying that her heart is already taken. In reality, she sadly thinks of Sasuke. One of the early Shippuden endings features a High School A.U., and there is a scene where Hinata gives Naruto a love letter. In Kaitou Saint Tail the titular protagonist, a stage-magic using Phantom Thief that steals from thieves to give the loot back to the legitimate owners, has the habit of sending rather romantic warnings to her beloved Sympathetic Inspector Antagonist... Who didn't notice they were barely-veiled love letters until a villain, seeing him calling one a 'burglary warning', pointed out it was a love letter and called him an idiot. Two of these 'burglary warnings' were delivered in the form of lunchboxes Saint Tail prepared with her own hands. A good part of the plot in Revolutionary Girl Utena would've been quite different if Wakaba hadn't sent Saionji a love letter, if had he not put it on display for everyone to read and mock and if Wakaba's best friend Utena had not challenged Saionji to a duel to punish him, leading her to "win" Anthy's hand as a result. In Sailor Moon, Ami Mizuno does not like love letters - to the point that she gets rashes from touching them. Yugami of all people gets one in Yugami-kun ni wa Tomodachi ga Inai. The problem is the letter puts him off because it overglorifies his personality and he doesn't even remember the girl that sent it to him. Kaguya gets a love letter in chapter 12 of Kaguya-sama: Love Is War. She has no intention of actually meeting the person that wrote it, but she pretended to be interested in order to force Shirogane to confess to her. The writer of the letter was never identified. Chapter three of We Want to Talk About Kaguya (which takes place concurrently with chapter 12 of the main series) rules out resident Kaguya fangirl Erika... while at the same time revealing that she has a massive box of letters addressed to Kaguya that she's never sent. The Ultimate Evil: when Valerie Payne tells Shendu that she wants to fall in love before becoming married, he takes it as a challenge and makes it a habit to send her love letters regularly. While Valerie doesn't want to admit any feelings for the Demon Sorcerer, she doesn't throw any of the letters away. Shendu states that he thought it fitting to use romanticism in letter writing to woo Valerie because it's becoming a lost art in modern times. He includes to the last letter a magical symbol that Valerie can use to call him, and it possibly saves her life when she's mauled nearly to death. Who Framed Roger Rabbit has Roger writing a love letter to Jessica. the paper turns out to have Marvin Acme's will written in "disappearing, reappearing ink". Love Letters is about, well, love letters, that cause a create deal of grief between three people. Book six of Ranger's Apprentice ends with Will getting a letter from Alyss admitting she loves him. He goes right away to tell her he feels the same. In Persuasion, Captain Wentworth writes a love letter to his Old Flame Anne Elliot saying "You pierce my soul. I am half agony, half hope." He actually writes it while she's standing in the same room, about five feet away, which she realizes while she's reading it later. In Emma, Robert Martin writes a letter with a marriage proposal to Harriet Smith. The actual letter is not a part of the novel, but it is a short but lovely letter, and even Emma admits it is very well-written, especially for a young farmer (of whom Emma snobbishly assumes that he cannot be educated). In Eugene Onegin by Alexander Pushkin, Tatiana confesses her love to Onegin in a beautiful letter. In Now I Rise, Lada opens a letter expecting it to be from her brother, and is shocked to see it is from Mehmed, her former lover. It's a long poem about her beauty, which she is annoyed by as he tried to read and write her poetry when they were together and she always rebuffed him. After the poem, there's a short and businesslike proposition concerning diplomacy and armies. It's rather abrupt, and Lada is unsure whether this means he still loves her or not. Confession Executive Committee ~Love Series~ 's Hina Setoguchi sets out to confess her feelings to her upperclassman Koyuki this way. Because he was returning from figuring out his own crush is getting together with someone else, she unfortunately couldn't give it to him or tell him the contents of it. Hina lets an "I like you" slip out, but nothing comes of the matter, and both leave unsatisfied. Our Miss Brooks: In "Bones, Son of Cyrano", Bones Snodgrass has been slipping love poems into Harriet Conklin's lunch. Walter Denton tries to compete by writing his own poem. However, he instead relies on Mr. Boynton's quotation from Cyrano De Bergerac. Walter gives the note to Harriet . . . the note in Mr. Boynton's handwriting. Soon, the note is mistakenly passed to Miss Brooks and even on to Mr. Conklin. Hilarity Ensues. Our Miss Brooks: In "Poetry Mixup", Stretch Snodgrass had been slipping love poems into Harriet Conklin's lunch. Walter Denton tries to write his own poem. However, Walter instead relies on Mr. Boynton's quotation from Cyrano De Bergerac. Walter gives the note to Harriet . . . the note in Mr. Boynton's handwriting. Soon, the note is mistakenly passed to Miss Brooks and even on to Mr. Conklin. Hilarity Ensues. The episode was later remade for television, with Stretch Snograss exchanged for his brother Bones. In The Rivals, Sir Lucius writes a letter expressing his feelings for Lydia, and enlists her maid to deliver it discreetly; it leads to an ongoing correspondence. What he doesn't learn until the end of the play is that the maid played a prank on him and he's actually been corresponding with Lydia's battleax of an aunt. Used pretty tragically in Rule of Rose, where Meg's love letter for Diana is not well-received, and the protagonist Jennifer gets to suffer ire from both sides after being unwillingly dragged into the mess. In Persona 4, the protagonist will receive love letters in his shoebox if he does good at tests, usually containing some useful item or other that a secret admirer has made for you. And if you think it's one of your Love Interests who did it, you're in for a shock later.... As the Fortune Social Link reveals, Naoto is also plagued by these on a regular basis ('plagued' because the detective prince has better things to do than play around with romance). You can collect these for a sidequest in Dragon Age: Origins. The quest-giver wants them as blackmail material over their noble authors. A Very Long Rope to the Top of the Sky: Emil writes one to Genevieve, in the form of a poem, and asks Ivy for help with what similes to include. Depending on the player's choices, Genevieve can either accept or reject the letter. This divergence persists even after the time-skip, affecting where you'll find Emil and some of the relevant dialogue. A letter of this nature turns out to be important to the plot later on - Sir Carrot wants to be Princess Parfait's Knight in Shining Armor, but he's too cowardly to protect her or even fight, which led to Parfait being imprisoned by the villains. He eventually receives a letter from her (thanks to the Nightmare Knight) and learns how much Parfait loves him despite everything, which gives him the confidence and bravery he needs. Realizing he got her letter, Parfait pours her love and faith into her carrot pendant, allowing Carrot to finally level up into a (literal) Knight in Shining Armor with the ability to use magic.